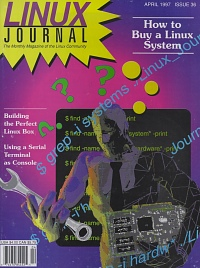 Quella raffigurata sopra e' la copertina del numero di Aprile 1997 del Linux Journal. L'ho tirata fuori perche' gironzolando in rete ho ritrovato un articolo che avevo pubblicato in quel numero della prestigiosa rivista. L'articolo mostrava come modificare la gestione della console nel kernel di Linux (se non ricordo male erano i tempi della versione 2.0.x) per consentire di usare un terminale seriale come console al posto di un monitor collegato ad una scheda video. A frequently asked, but never completely answered, question in the comp.os.linux. * newsgroups and other Linux mailing lists, is the one about cheap, headless Linux boxes. It seems that many people need to install Linux boxes without a video card, a monitor or a keyboard. A cheap response to this problem is to use a serial terminal (Wyse or Ampex, for example) as the main Linux console. This cuts the cost of a keyboard, a video card and a monitor. I've done this very thing on my second computer, an old 486 VLB, by using a Wyse 60 terminal. Linking a terminal to your computer's serial port is not at all difficult. You can easily follow the instructions in the Serial-HOWTO and in the inittab(5) and agetty(8) man pages. Here's a short summary. First, you must use a null modem cable. Second, insert the following line in your /etc/inittab file, if you're using agetty. Other getty programs, like getty_ps, use a different syntax. for a serial terminal on the /dev/ttyS1 port (COM2 for DOS users), with a port speed of 9600 BPS and vt100 terminal emulation (which seems to run better than native Wyse 60 mode). Finally, restart init with the command init q. If you correctly followed these three simple steps, you should see the login prompt on your terminal screen. You can log in and work on your machine in the same way you can when you're actually on the console or telneting from a remote host. The messages the kernel shows at boot time are always directed to your main console (tty1). If you turn on your headless box, you can only wait for the login on the terminal, which means losing those precious messages. You can see them by using the dmesg command, but usually you need them before the login shell comes up. There are other messages on your console: those generated by the scripts in the /etc/rc.d directory, and from scripts run at boot and shutdown time. How can you really know that “the system is halted” if you can't read it on a monitor? You must patch the /usr/src/linux/drivers/char/console.c program in your kernel source tree. It's not a complex kernel hack. You can follow these three simple steps. Third, rebuild your kernel and reboot: you should see on your terminal screen the kernel messages during your system's hardware devices probe. To show these messages on your terminal, you can append > TTY to every line of these files that contains the command echo. TTY is the terminal serial port (the same one used in /etc/inittab serial terminal line). If you want to choose among more than two kernel images, you have to modif the LILO configuration file, /etc/lilo.conf. Complete instructions for seeing the LILO prompt on serial terminals can be found in the /usr/doc/lilo/README file (look for the SERIAL option). Here are two steps to do that correctly. This line means COM2 at 9600 BPS, no parity, 8 bits per character. Second, execute the lilo command to update your system's configuration. Using the SERIAL option, LILO sets a two second delay (the same as when you put a delay = 20 line in the lilo.conf file) before booting the default kernel image. During this pause, you can interrupt the boot process and get the LILO prompt by sending a break to the terminal as you press the SHIFT key on your main console. At last, your serial terminal can be used as a real system console. I think that the only thing you can't do is the CTRL-ALT-DEL reset—except, perhaps, with certain terminal emulations. If you're lucky, you can find one of these terminals cheaply, maybe even free, from a company upgrading its hardware. Vediamo come cambiare il logo visualizzato sulle pagine e sui messaggi stampati con uno di nostra scelta. Aprite il file webmail/inc/inc.php e andate alla riga indicata nel messaggio di errore. Header("Expires: Wed, 11 Nov 1998 11:11:11 GMT\r\n". Oggi sto sperimentando un po' di webmail da installare su server Debian. Per default il programma tsclient (Terminal Server Client) utilizza i protocolli RDP e VNC. Per abilitare l'accesso XDMCP su un host Ubuntu potete seguire due strade. Nella sezione XDMCP cambiate il campo Enable da false a true. Errore Adobe Reader: the print process returned error. Please check whether the printer is connected to the machine. Errore: Has an A record but no DHCID, not mine. Lo scenario e' costituito da una subnet con DHCP che aggiorna dinamicamente il DNS ad ogni rinnovo di indirizzo IP. Mar 16 20:29:05 server dhcpd: Forward map from hostname.domain.local. to 10.1.1.123 FAILED: Has an A record but no DHCID, not mine. Ho trovato diverse soluzioni proposte, ma non la piu' ovvia (almeno in questo caso): esisteva infatti una definizione statica di hostname.domain.local nelle zone forward e reverse del DNS. update-rc.d keriomailserver start 99 2 3 4 5 . stop 20 0 1 6 . Al prossimo boot il server sara' presumibilmente attivo. Se chiudete aisleriot mentre si trova in modalita' a pieno schermo, puo' capitare che alle successive esecuzioni il programma restera' in questa modalita' senza possibilita' di uscirne. 2. Eseguite gconf-editor (senza usare sudo). 3. Navigate fino a Apps->Aisleriot. 4. Trovate la chiave "maximized" e assicuratevi che non sia selezionata. 5.Trovate la chiave "fullscreen" e assicuratevi che non sia selezionata. 12. Eseguite Aisleriot. Dovrebbe partire in modalita' finestra.